At this stage of building there are few of the spectacular changes to the boat's appearance that occur when planking up or fitting decks. 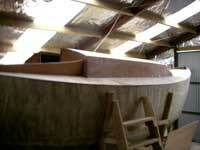 The pieces being fitted are small and there is much finishing work happening. Things like electrical wiring, water tankage and piping, fitting up the cabin heater fuel tank etc are all things that contribute to the boat's progress but they are not much to look at and photos of this sort of thing are hard to make exciting. 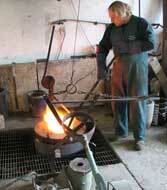 However, we have just had a really good day watching foundryman Roger Woodhouse making Resolution’s cast bronze fittings. Charlie had spent a couple of weeks making the patterns from my drawings, using MDF sheet, five minute epoxy and car body filler it took a while but he made a light wooden (sic) replica of each item needed. We took those over to see Roger to make sure that they would be able to be used for making a mould, and to get an estimate of the costs involved. Roger at the furnace, roaring away under the pressure of a big air blower and seriously hot. This photo does not give much of an indication of its sheer energy and heat, a good place on a winters day. 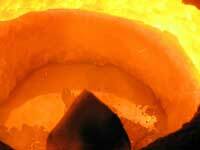 The melted bronze, it looks quite beautiful, but don’t be fooled this is unbelievably hot. The first estimate was a shock, a lot more money than we thought , but after some negotiation and a change to a less expensive metal brought that back to a workable level and Roger issued an invitation to come over and watch as he did some of the pour. We arrived to find the furnace roaring away and several bars of what looked like pale gold ready to feed into the crucible, a double row of two layer steel boxes full of black sand lined up on the floor and Roger busy pressing the stemhead fitting pattern into an other box. Some of the patterns are quite challenging from a foundryman’s point of view, thin sections connecting with thick ones, tight radius intersections and deep thin sections that could only be set edge on into the mould. 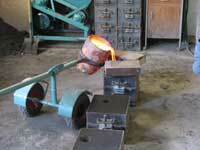 The crucible, full of molten bronze and ready to be carried off with the trolley and poured. Glowing hot, even in broad daylight. Pouring, flowing in like water, it looks like glowing hot liquid gold, beautiful to watch. An exciting moment. A better shot, moulding sand in the background corner, stone weights to hold the moulds to stop the metal floating the top of the mould off, and the crucible trolley in action. Roger's great; he’d thought it over and figured out how to do it. My homework (read several books that I found in the library) seemed to have been helpful as no modifications to patterns were required plus a large dose of his skills made for a successful day. It was quite spectacular to watch, the roar, the heat and glow radiating from the furnace is quite something even in this small operation, the careful handling of the “pot” full of glowing hot metal that is so liquid it flows like water, the heat radiating off it is such that you could grill your steak from several paces away and the whole thing looks like the inspiration for some of the underground volcanic scenes from Lord of the Rings. 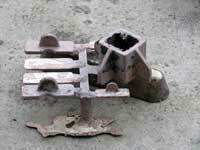 The two bow roller fittings, the bit that is joining them is the pathway for the metal to follow through the sand mould to fill the space that when hardened becomes the moulded part. All that gets cut away and remelted for another part. 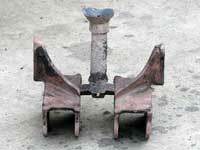 The cranse iron for the end of the bowsprit, deck pads, and a bar of the original metal. Good strong fittings, custom made for the job, at a lot lesser price than you’d find them in a shop for. A very worthwhile exersize. Roger and his helper wheeled the crucible over to the moulds (yes there is a proper name for them but foundry terminology is not something that I am familiar with and you all know what I mean) and literally just poured it in. This is metal, tough metal, and watching it being poured in like water from a tap is quite something. 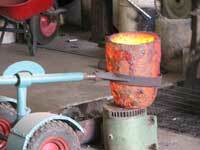 We stood well away, just in case, our light shoes are not the thing to cope with spilled molten metal. 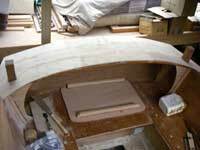 A while later a mould was picked up and split, shaken out and the castings pulled free from the sand. Even sitting on the concrete floor they had an air of solidity about them that the wooden patterns did not have. I can tell you that if you are building one of these, then there is no need to make the patterns a little heavier ( for strength ) than I have drawn them. These are strong, they have quite a reserve and while I had calculated the strengths it's quite different to see the real thing. Another stage of the build done. There is a lot of cleaning up, drilling and countersinking and polishing to do, but it's more progress. Fun? 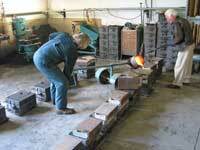 You bet, it feels quite primal, casting metals.